Drop inches from your waistline with the sculpting moves in POWER AB BLAST. You've seen contestants dramatically slim down on NBC's hit series "The Biggest Loser" and now it's your turn! Shape a strong and defined core with the POWER AB BLAST workout! 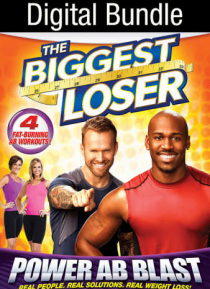 Burn belly fat and get those chiseled abs you've always wanted with trainers Bob Harper and Dolvett Quince.